We are the Carey family, and group Halloween costumes have become a tradition for us over the past 3 years. This year we decided to tackle Scooby-Doo. It’s a bit overdone, but we thought we could bring a freshness to it. As always, most of our costumes are made up of pieces purchased at thrift stores. However we usually have to purchase the wigs and a few hard to find items online. Scooby-Doo: This was the biggest challenge. We knew we didn’t want to go too literal and purchase an actual dog costume. Luckily we found this great jacket at a thrift store. We used a fabric marker to paint on the black spots, and rounded out the ensemble with brown leggings and leg warmers to give it a retro feel. The collar was made with foam core and a painted belt. And the ears were cut from a stuffed animal and adhered to a head band. 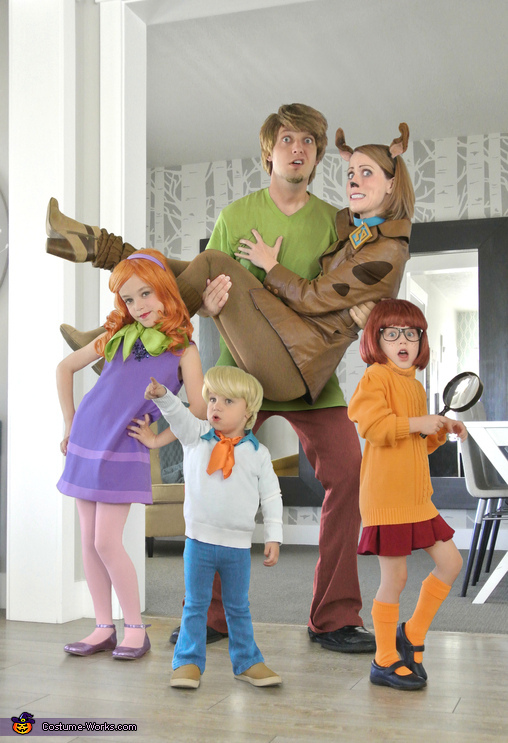 Shaggy & Fred: The trick to these costumes was to use girls and women pants. It was the easiest way to achieve the retro bell bottom look that you don’t currently find in men’s clothes. We purchased oversized shoes to finish it off. Fred’s wig also needed to be trimmed way down to look right on a toddler. Daphne: We lucked into this great purple dress at a thrift store. It didn’t have sleeves, which is probably the biggest inaccuracy from the cartoon, but it still had the right feel. We painted light purple stripes on the bottom. Velma: The orange sweater was difficult to get just right. We actually combined the turtle neck from one sweater with the body of another. We had to taylor the sleeves to get the baggy look. We hope to continue this tradition until our children are too embarrassed to go along with it. They love it for now. We’re already thinking of what we can do next year.